Haematopoiesis describes the process by which the cellular components of the blood are formed. In adults, the predominant site of haematopoiesis is the bone marrow. Here we find the multipotent hematopoietic stem cells (HSCs). The HSCs are able to differentiate into both myeloid or lymphoid cell lines. Furthermore, the ability to self-renew facilitates continued production of blood cells. Haematopoiesis is essential to the continued production of all blood cell lineages. Three major cell types exist; red blood cells (erythrocytes), white blood cells (leucocytes) and platelets (thrombocytes). Leucocytes are further divided into a number of specialised cell types, including monocytes, basophils, neutrophils, eosinophils, B & T lymphocytes, dendritic cells and natural killer (NK) cells. Haematopoiesis is a highly regulated process and its dysregulation may lead to deficiencies (e.g. anaemia, leucopaenia, thrombocytopaenia) or over-production (e.g. haematological malignancies). Blood is an essential transport medium for the human body, which facilitates movement of erythrocytes, leucocytes and platelets. Blood is composed of haematocrit and plasma (approx. 45% and 55% respectively). 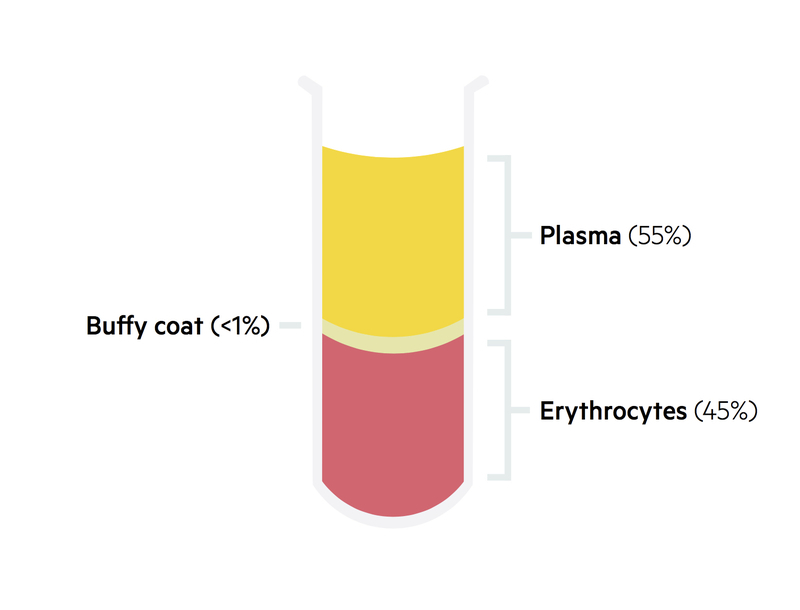 Haematocrit is composed of erythrocytes and it is the densest component of blood. In contrast, plasma is mainly composed of water - though it also contains protein (e.g. albumin, immunoglobulins, fibrinogen) and non-protein components (e.g. vitamins, lipids, hormones). When left stand within a test tube blood will separate out into its different layers. The more dense haematocrit will aggregate at the bottom, whilst plasma will float on the top. A thin layer, termed the 'buffy coat', sits in-between. It contains leucocytes and platelets. It accounts for <1% of blood volume. In utero, the production of blood cells begins in the embryonic yolk sac around 14-19 days. The predominant site of haematopoiesis in the foetus during the second trimester is the liver. From seven months, the bone marrow takes over and continues to be the predominant site in adults. In the first four years of life, almost all marrow cavities contain haematopoietic tissue, termed red marrow. As we age, the quantity of this haematopoietic tissue decreases and is replaced by fat (yellow marrow). In adults red marrow is limited to the axial skeleton and long bones. Early haematopoiesis has limited leucopoietic activity. Maternally derived antibodies are therefore key to the immune system early in life. Normal adult haematopoiesis occurs within the bone marrow and at a steady state of to match the loss of mature blood cells. The increase in yellow marrow during ageing restricts sites of haematopoiesis to the axial skeleton and proximal ends of long bones (e.g. femur and humerus). In the presence of defective or insufficient haematopoiesis in the bone marrow, expansion of the red marrow may occur. Haematopoiesis can occur in organs such as the liver and spleen, termed extra-medullary haematopoiesis. All blood cells are derived from the most primitive haematopoietic cell, referred to as a multipotent haemopoietic stem cell. From these cells, all cell lineages can be formed. Successful haematopoiesis is dependent on both cell proliferation and cellular maturation (e.g. development of structural and functional characteristics). 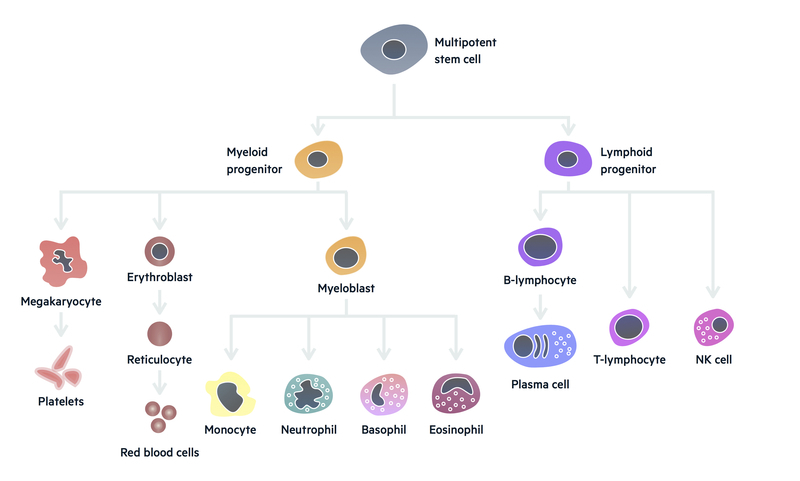 Pluripotent haematopoietic stem cells are able to give rise to two further stems cells, named multipotent myeloid stem cells and multipotent lymphoid stem cells. 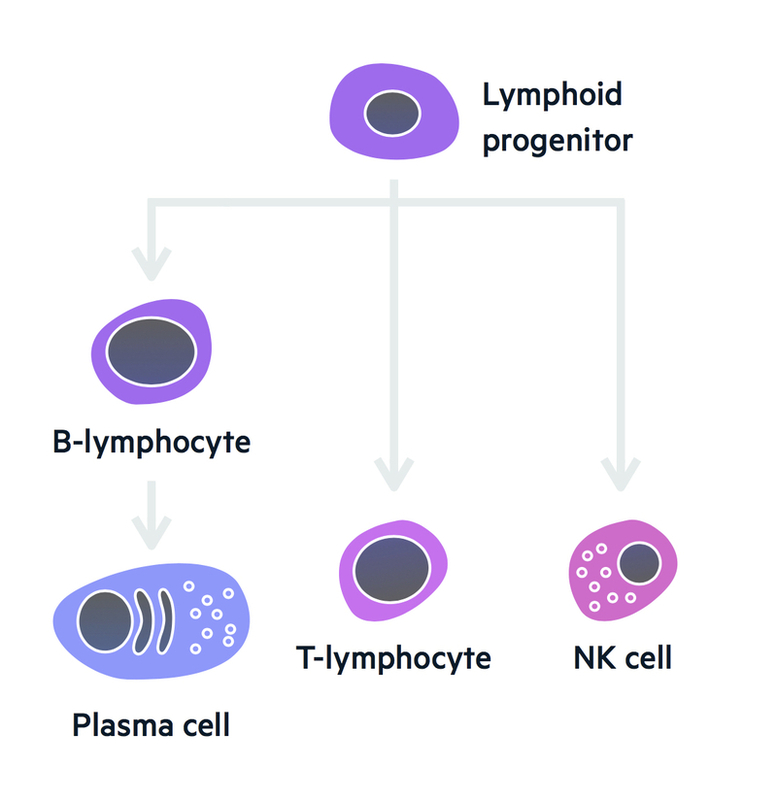 These lymphoid stem cells are able to differentiate into a number of progenitor cell lines that eventually give rise to B lymphocytes, T lymphocytes and natural killer cells. 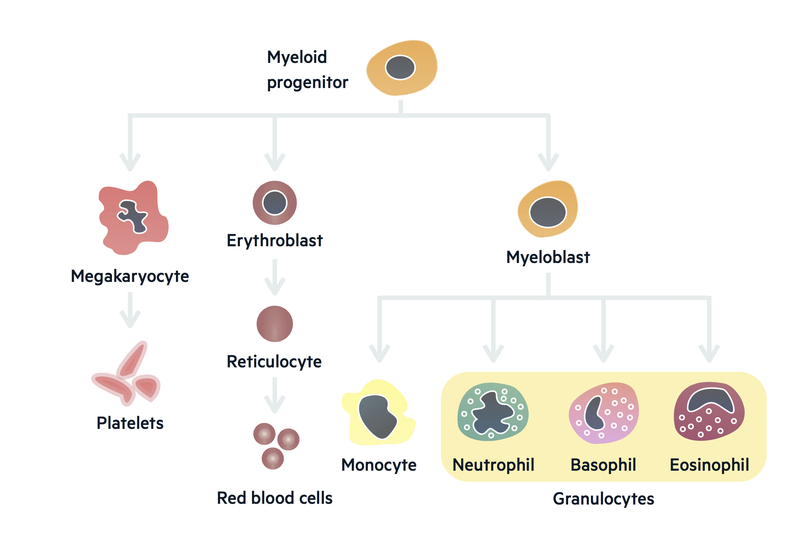 The myeloid stem cells differentiate into a number of different progenitor cells that give rise to the rest of the blood cell lineages including erythrocytes, thrombocytes, neutrophils, monocytes, basophils, eosinophils and mast cells. As the progenitor cells undergo further differentiation their ability to differentiate becomes progressively halted and there is limited capacity for self-renewal. The regulation of haematopoiesis is dependent on glycoprotein growth factors, which drive the proliferation and differentiation of progenitor cells. EPO is essential for the proliferation and maturation of red blood cells. Its release is triggered by low haemoglobin concentration.The gene for EPO is located on chromosome 7 and the product is a 165 amino acid polypeptide hormone. TPO is produced by the liver and essential for the control of platelet production. Erythrocytes are non-nucleated cells, approximately 7 microns in diameter, which are essential for the transfer of oxygen around the body. They are considered the most numerous of blood cells and last for approximately 110-120 days within the blood before being removed from the circulation by splenic and liver macrophages. Haemoglobin is the oxygen carrying molecule, which is composed of four polypeptide globin chains that each contains a haem group. Adult haemoglobin (HbA), which contains two alpha and two beta chains, is produced within the mitochondria of developing red cells. The haem group contains a ferrous atom and a porphyrin ring, which allows the reversible binding of an oxygen molecule that can be transferred to the tissue where it is needed. Erythropoiesis describes the process of erythrocyte generation, which occurs in the bone marrow and is dependent on EPO release from the kidneys as described above. Leucocytes, nucleated cells found in the blood and reticuloendothelial system, are components of the immune system. The predominant role of leucocytes is to protect against pathogens. Additional roles include immunomodulation, immune surveillance and inflammation. Neutrophils, the most abundant of leucocytes, have an important role in the innate immune response. They are approximately 9-15 microns in diameter and have a segmented nucleus with 3-5 lobes. Monocytes are the largest type of leucocyte, which are able to enter peripheral tissue where they become macrophages, also known as histocytes. Monocytes are 15-30 microns in diameter. Both neutrophils and monocytes are able to phagocytose pathogens. Monocytes and subsequently macrophages have additional roles in antigen presentation for activation of the adaptive immune system. Other common leucocytes include basophils and eosinophils. Eosinophils are approximately 12-17 microns in diameter and important in host defence against parasitic organisms and allergic-type diseases. Basophils are approximately 10-14 microns and have large granules that contain histamine. Basophiles, eosinophils and neutrophils are collectively referred to as polymorphonuclear leucocytes or simply ‘polymorphs’. Finally, lymphocytes are an essential component of the adaptive immune response. T lymphocytes are critical in cell-mediated immunity, whereas B lymphocytes are critical for humoral immune response and the production of immunoglobulins. Platelets are essential in the formation of a haemostatic plug at the site of vascular injury. These cells are approximately 1/5th the size of erythrocytes and like erythrocytes lack a nucleus. They are derived from megakaryocytes within the bone marrow. Large numbers of platelets can be released directly into the bone marrow sinusoids from a single megakaryocyte. Low platelets (thrombocytopaenia) may be seen in a number of disease processes (e.g. idiopathic thrombocytopaenic purpura) and predispose to bleeding. Platelet function may also be inhibited by a number of commonly use anti-platelet drugs (e.g. aspirin and clopidogrel). The full blood count (FBC) is an essential blood test, which automatically measures a number of parameters helping us to interpret the function of the blood and bone marrow. The FBC gives us a number of values. Essential values include the haemoglobin concentration, leucocyte count and platelets. Other values help to further differentiate the type of pathology. Haemoglobin concentration helps us assess for anaemia. The type of anaemia can be further evaluated by the MCV, wth anaemia being microcytic, normocytic or macrocytic. The leucocyte count may be raised during infection and could be almost zero in neutropenic sepsis. A leucocyte count differential helps us further evaluate the leucocytes. For example, we can look for a neutrophilia (high neutrophils) or lymphocytosis (high lymphocytes). Platelets may be raised as part of the acute inflammatory response or in certain diseases such as the myeloproliferative disorders. The presence of anaemia, leucopenia and thrombocytopenia is referred to as pancytopenia and may indicate failure of the bone marrow and normal haematopoiesis. We'd love to hear your feedback on our Haematopoiesis notes.